This has been hands down our most challenging farming season yet. We knew that it would be inherently difficult because we moved the farm from our leased location in Candler to our new farm in Asheville (and moving a farm is not for the faint of heart), but between the weather and unforeseen circumstances, its been exponentially harder than we imagined. So for any of you that look at the picture perfect moments posted on social media and dream of being a flower farmer, take it from me that there is always more to the story than what you see in those dreamy squares! Just to give you an idea of what farmers all across Western North Carolina have been dealing with, the annual rainfall for Buncombe County is 37 inches and as of today in late August, we have already received about 49 inches of rain. During just 6 days of May, we had more than 3x the amount of rain than we usually get in all of the month of May. Bottom line: we have had WAY too much rain. Despite the expected challenges that too much rain brings - field flooding, fungal diseases, not enough sunlight, soggy feet - the most heartbreaking part for our little farm is that we lost our entire dahlia crop. We planted our 2,000 dahlia tubers on May 1 which is typical for our area. Looking back over my field notes, I wrote that on May 17-19 we had "too much rain" and then a note on May 20th that we had over 12" of rain that week. On May 21, I wrote that most all of the dahlias were sprouting and was feeling kind of hopeful that they would survive, but then it continued to rain for another week and half. After doing some exploratory digging to check on the tubers, it was clear that almost all the dahlias were rotten. As devastating as the loss of that crop is our business, I've taken this season as an opportunity to study what plants can survive or even thrive in soggy weather and also its helped me to learn more about the drainage (or lack thereof) in our fields and how to better plan for next year - more on that in a later post! So what flowers are doing well this year? Lots of them! But especially the zinnias - this is hands down the best zinnia crop that we've ever had! I've always loved zinnias and tend towards growing way too many. My goal this year was to limit production to a handful of varieties that I love using in design work, that really pop in market bouquets and that sell well to other designers. Goal achieved! 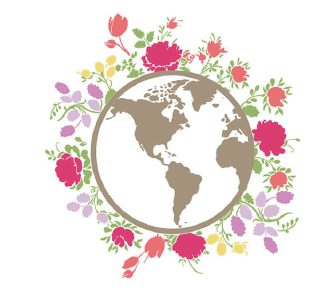 The first thing to consider when planting any patch of flowers is what is you purpose for planting them? The enjoyment of looking at them in the garden? Market bouquets? Wedding work? Giving them to friends? 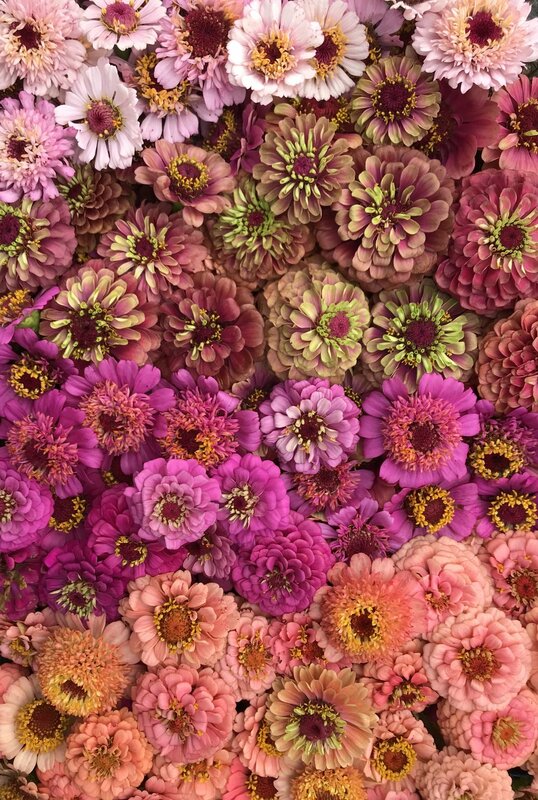 With so many different varieties, sizes and colors of zinnias, its especially important to ask yourself these questions before buying your first packet of seeds. My main purpose for zinnias is wedding design work and grocery store bouquets. Zinnias are extremely prolific bloomers and the more you cut them, the more they keep blooming. I would estimate that I get anywhere from 12-25 stems per plant. That's a lot! So you can see why its easy to plant too many. I planted 5 successions of zinnias this year with an average of 500 plants per succession, so just as one succession is slowing down or succumbing to powdery mildew, the next succession is starting to bloom. I just adore the Oklahoma series because the blooms tend to be much smaller and thus easier to work into bridal bouquets and even boutonnieres. I find that the bigger blooms, for example in the Benary's Giant series, are just too bright and large for design work. While the Benary's are great for market bouquets, I've learned that we just don't need that many blooms in the field and we just add more of the smaller blooms into market bouquets instead. I also love the Zinderella series because of the soft colors that are perfect for blending in wedding work. Even though our climate is too warm for the plants to produce many of the coveted double blooms, I almost prefer the singles. And my all time favorite will always be the Queen Red Lime. There just are not many flowers that compete with the perfect dusty rose, mauve shade of this flower. I could go on and on about what other flowers have loved the rain this year (veronica, feverfew, cosmos, etc. etc. ), but I would love to hear how this summer has been for you! Do you grow zinnias or have you found any new favorite must-grow-again flowers? And I hope that my over-sharing about the challenges of this season don't deter you from farming or gardening - I just wanted to share a little bit about the reality of farming. There most definitely is a lot of beauty, but it certainly is not easy.